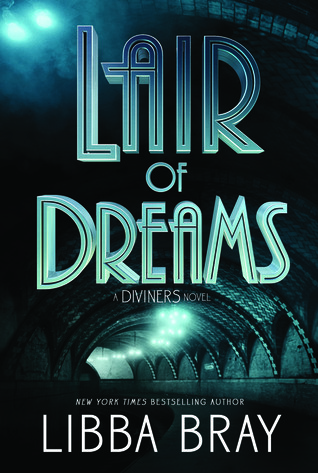 Presenting The Diviners #2 Lair of Dreams by Libba Bray. After a supernatural showdown with a serial killer, Evie O’Neill has outed herself as a Diviner. With her uncanny ability to read people’s secrets, she’s become a media darling, earning the title “America’s Sweetheart Seer.” Everyone’s in love with the city’s newest It Girl…everyone except the other Diviners. Piano-playing Henry DuBois and Chinatown resident Ling Chan are two Diviners struggling to keep their powers a secret—for they can walk in dreams. And while Evie is living the high life, victims of a mysterious sleeping sickness are turning up across New York City. As Henry searches for a lost love and Ling strives to succeed in a world that shuns her, a malevolent force infects their dreams. And at the edges of it all lurks a man in a stovepipe hat who has plans that extend farther than anyone can guess…As the sickness spreads, can the Diviners descend into the dreamworld to save the city? In this heart-stopping sequel to The Diviners, Printz Award-winning and New York Times bestselling author Libba Bray takes readers deeper into the mystical underbelly of New York City. This book weighed a ton and somehow still managed to bore me to sleep. Really wasn't expecting this after the sensation that was the first book, The Diviners. Thing is The Diviners didn't really need a sequel because it did well as a standalone adventure. It had an escalating murder mystery and a fast paced plot coupled with the gorgeous flapper era introductions. The best. So you can imagine, the excitement of finding a sequel and then getting disappointed that not only did its release date get pushed back a lot but it also wasn't anywhere near the pace set by its predecessor instead of just taking pages-after-pages to spew nonsense. I might be amongst the minority that didn't enjoy this book that much too. Skimming through a lot of sections to get through it. Not a good sign when trying to enjoy a book but pretty much 80% of the book just dragged with useless nonsense and there were too much 20s slang. Did not like that part at all. Evie has left the museum and does radio shows now to read for people and the remaining time she party's and gets disgustingly drunk. Will is pushed to the side. Jericho is left to care for the museum, while pining after Evie. And Mabel is just put there to pine and whine after Jericho. Sam researches his past and Project Buffalo. Theta and Memphis are there in background roles and Henry and Ling are walking dreams. I did appreciate the author exploring dreams and myths and fantasies. Sleeping Sickness. Lucid dreaming. Changing structure in dreamscapes and the like. I liked Henry & Ling making such discoveries in their sleep but they took too so much time to realize what was going on that the novelty of that doesn't strike it much as you would expect it to be. So no I didn't like this book but i'm not giving up on this series too. Will wait and see what Ms. Bray publishes next. "Dreams or no dreams, Lair of Dreams just didn't strike my fantasy at all"
Oh bummer. I still need to read this one. I too really enjoyed The Diviners despite the intimidating size. I was very much looking forward to another adventure. Will just have to wait and see how it goes once I find time to crack her open! Nice honest review though!